But I got stuck on the domain without the www-part. I messed with my DNS settings but I couldn't get it going. I constantly got "Page not found" or other errors. But I finally figured it out and it's actually embarrassingly easy :). But hey, if it's too easy, nobody will blog about it and all people encountering the same problem will spend hours looking for it, waisting time to eventually facepalm themselves, so I might as well help them out :p.
Go to your Blogger dashboard, choose Settings and click Basic. 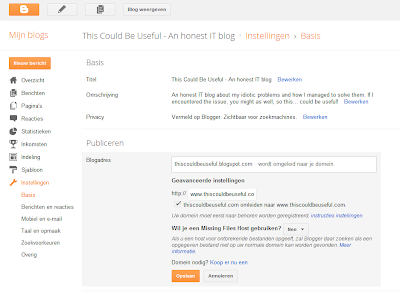 In the "Publicize" section you can find "Blog address". 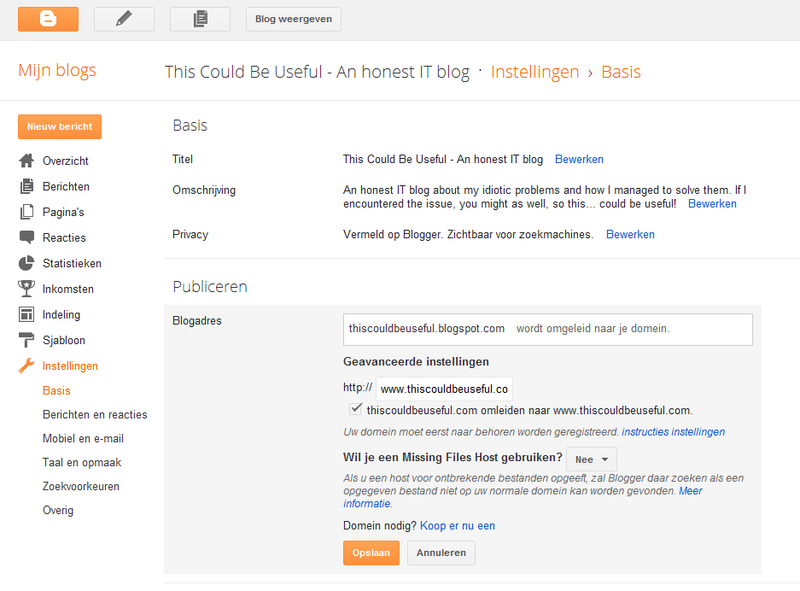 You can see that my blog address "thiscouldbeuseful.blogspot.com" is being redirected to "http://www.thiscouldbeuseful.com". Below that, there's an option to redirect "http://thiscouldbeuseful.com/" to "http://www.thiscouldbeuseful.com/", which was not there when creating the custom domain (or I seriously overlooked it :))... that's all to it. This worked instantenously for me, so you can go straight ahead and test it.